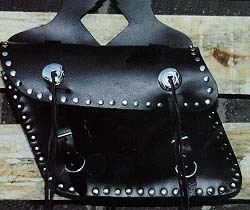 Dress your bike with this studded slant bag of genuine cowhide. Cut outs. Double strap billet fastening. Conchos may be upgraded as easily as rethreading the lacing ties. Medium sized. Sizes: 12 1/2" x 9 " x 4"